Have you ever looked at another person and thought, “wow, I wish I could do that”, or “it would be awesome to look that amazing?”, or “his life seems perfect!”? I know I have. In my humanness, I have lapses of gratitude, and go to a place where I think that I’m not as fortunate as someone else. Thankfully it doesn’t take too long before I realize (again) that I’m blessed, in so many ways. I then thank God for the life I have, the people who are in it and the bounty I sometimes take for granted. Part of the human condition, at least in our culture, is one where attainment, activities, and appearances are the measuring stick of worth. Too often, it’s easy to slip into the trap of “I wish my reality was different“. I’m reminded of the folk tale of the stonecutter who was discontent with his life. 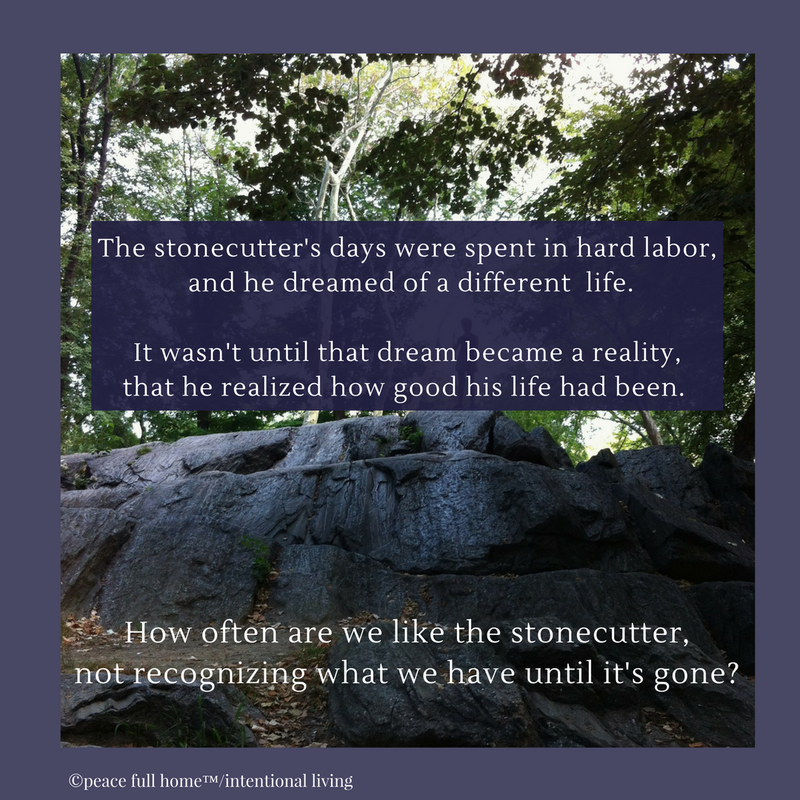 The stonecutter’s days were spent working hard, chiseling stones from giant rocks. One day, as he passed the home of a wealthy merchant, he thought about how powerful and happy the merchant must be and wished he had that life. To his surprise he became the wealthy merchant, detested by those “beneath” him. Eventually dissatisfied with that life, he longed to be an important official, seated on a chair and carried high in the air as everyone bowed before him. He became that and his position made him feared by all. Again discontent, he looked up and saw the sun high in the sky and desired to be the sun—shining brightly, powerful and unaffected by mere mortals. He became the sun, cursed by farmers and workers who sweltered under his heat as he scorched the fields. Then, a huge, dark cloud came between him and the earth and his “light” could not be seen. He envied the cloud’s power and wishing he could be it, became the cloud. He flooded the villages and fields and as the people shouted at him, he was pushed aside by some great force—the mighty wind. He coveted that intensity, and wishing for it became the wind—uprooting trees, blowing roofs off houses, instilling fear and destroying everything in his path. But there was one thing that he could not move. It was a huge, imposing rock. He was in awe of that rock’s strength and wished to become that rock. When he became the rock, he believed he was finally more powerful that anything on earth. He would never need to be anything more. Then, he heard the sound of a hammer and chisel. He felt himself being altered. He thought, “What could be more powerful than me, the rock?” He looked down and far, far below him, he saw the figure of a humble stonecutter. The late philosopher Friedrich Nietzsche wrote that, for humans, the primary driving force is to be superior to others; to be in a position of power (yea in the most powerful position). We assess the power—real and perceived—that others have and we want to have that kind of influence. Like the stonecutter, we sometimes envy or wish we could be like someone else. And, just like him, we all have value right where we are. Our contributions are different because the roles we play, in this journey called life, are different. We can’t all be financially wealthy, although most of us have more monetary wealth than we appreciate. We can’t all be supermodels, although we are all beautiful in our own ways. We can’t all be heads of state or businesses or churches, but we can make a difference in the roles we do play. Once we get out of the habit of defining ourselves by how we compare to others and choose to define ourselves by the significance we do have, our lives will blossom exponentially. And then, as we live into our gifts, we can find the road back home to who we really are. Until the stonecutter could be at peace with being who he was, he would never find contentment. He would live out his life wishing, dreaming and praying for something different—something “more”. Sadly, he had it all along…he just didn’t see it until it was gone. 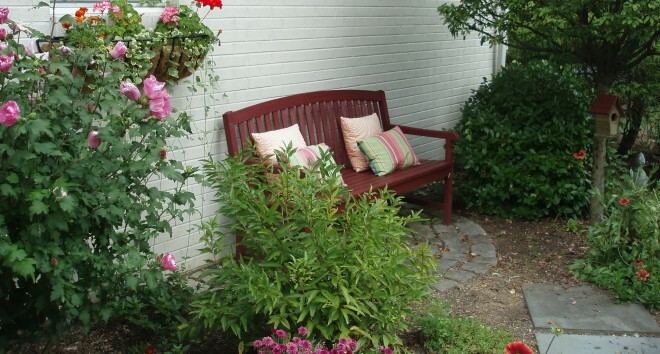 This entry was posted in Peace Full Home and tagged being envious, clouds, comparison, contentment, control, dreaming, Life, power, rocks, roles, strength, value, weakness. Bookmark the permalink. Love the stonecutter story. So relevant! So very true, thank you for the reminder.